On one episode of Comedy Central’s Insomniac, the show’s drunken host, Dave Attell, stumbles into a state fair somewhere in middle America. There’s a band playing, and he makes it to the side of the stage. Suddenly, he leans into the camera, an expression of wild joy on his face, and screams, "It’s the Scorpions!" His excitement was likely shared by a large percentage of the viewers, even if they were surprised to find themselves so entranced by an act they’d probably forgotten. The Scorpions, still one of Germany’s most successful cultural exports, have been unkindly treated by fashion. Though metalheads have a reputation for loyalty, they can be as fickle as hip-hop fans. But the Scorpions’ output hasn’t really dipped much in quality since their commercial peak in the 1980s, even if very few people are still paying attention. This 3-CD set is just about the ideal summation of their 30-year career, for those who haven’t been. Disc One contains a few surprises. The Scorpions weren’t always the glossy metal machine they became in the 80’s. They started out, in 1972 or so, as a progressive hard rock band in the vein of Kansas or Rainbow, and the two songs from their debut album, "I’m Going Mad" and "Speedy’s Coming," sound like a watered-down, slightly off-kilter take on FM radio fodder of that time. Only a few years later, tracks like "Virgin Killer" and "Steamrock Fever" were significantly harder and more anthemic. It was during these years that the band began to earn its live reputation through relentless touring. They were one of the first Western rock bands to play in the Far East and they won themselves an enduring audience in the process. The 1970s were a great time for hard rock as bands put out records at least once a year and hit seemingly every major city in support. Sure, it took a lot of coke to keep the show on the road, but for fans, it was a fool’s paradise. Disc Two documents the Scorpions’ commercial peak. Albums like Blackout and Love At First Sting were hugely successful, and the band’s signature tracks ("Big City Nights," "No One Like You," "Still Loving You," "Bad Boys Running Wild," and, of course, "Rock You Like A Hurricane") are all here. 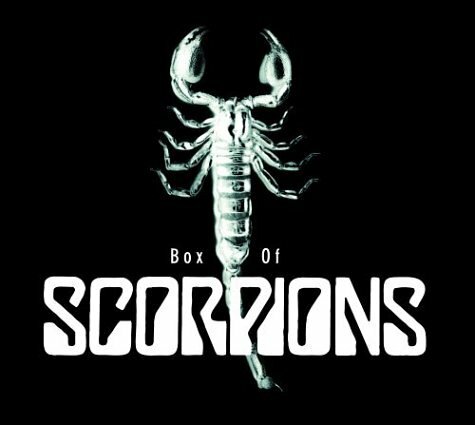 By 1982, the Scorpions were a worldwide metal sensation, and these songs are seared into the memory of anyone who was listening to the music in those years. They still hold up, too. Just about everything on this box does. Most of the band’s weakest tracks are on Disc Three. During the second half of the Eighties, "power ballads" (slow, soft acoustic intro, big bombastic chorus) became the key to chart success for metal acts, and the Scorpions embraced the form. There are some serious contenders (Sting’s "Russians," Prince’s "Ronnie Talk To Russia") for worst song about Cold War politics, but the Scorpions are the clear winners. Their post-Berlin Wall anthem, "Wind Of Change," features some of the most cringe-inducing lyrics ever written on the subjects of freedom, brotherhood, children being the future and whatnot. Disc Three also contains some quality material, though. "Alien Nation," "Over The Top," the electronically processed "Mysterious" (from their widely loathed Eye II Eye album), and "Cause I Love You" are all anthemic and crunching, in the tradition of their best middle-period material. And on the subject of that middle-period material, there’s an orchestral arrangement of "Rock You Like A Hurricane" on this disc that must be heard to be believed. The Scorpions are not a great band. They never pioneered a sound the way Black Sabbath or Led Zeppelin did. But they wrote some very good, melodic heavy metal songs, and each of this set’s three discs will make the listener grin and pump his/her fist in the air. And that’s all anyone has a right to demand from a metal band.